Chef extraordinaire Eric Ripert is no ordinary chef and Le Bernardin is certainly no ordinary restaurant. 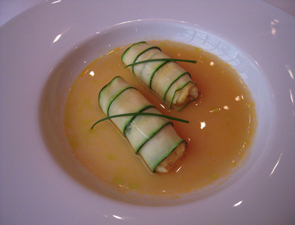 Born in Antibes, France, Chef Ripert's background is truly four-star. Having began his culinary education in his grandmother's kitchen, Chef Ripert attended culinary school in Perpignan and moved to Paris to work at LaTour D'Argent, a restaurant with true staying power that dates back more than 400 years. After La Tour D'Argent he worked for Jamin, Joel Robuchon's Michelin three-star restaurant, to which he returned at the request of "The Chef of the Century" after his military service. By 1989, Chef Ripert had moved to the United States, where he worked at the Jean Louis in the Watergate Hotel before making the momentous move to New York, where he worked under David Bouley and, ultimately, at Le Bernardin. Today he stands decorated with multiple awards as co-owner of one of the most talked about restaurants in the country, with three others in Philadelphia (10 Arts), Washington, D.C. (Westend Bistro) and Grand Cayman (Blue), all in conjunction with his consulting business and with the Ritz Carlton. He also has three cookbooks and a new television show, "Avec Eric," which will begin airing in September 2009. With all that on his plate, he still manages to keep Le Bernardin fresh and full of life. He does get assistance from the incredible talents of award-winning Executive Pastry Chef Michael Laiskonis, whose delectable creations are like symphonies on a plate, and award-winning Wine Director/Chief Sommelier Aldo Sohm, who presides over the multifaceted wine list. 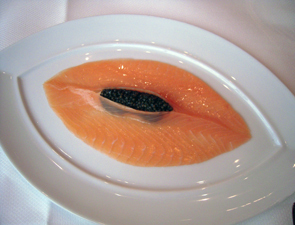 If you'd care to read Le Bernardin's dinner menu, please read on. For the lunch menu, please click here. To read about our delectable meal with Chef Ripert and to get to know him a little better, please click here. Chef's Tasting Menu (per table only, $185 per person / with wine pairing, $325 per person): Kumamoto (progressive tasting of kumamoto oyster "en gelee," from light and refreshing to complex and spicy; Kasumi Tsuru, Yamahai Ginjo, Hyogo); Egg-Caviar (poached pastured egg, osetra caviar, mariniere broth and English muffin; Dom Perignon - Moet & Chandon 1995); Scallop (ultra rare scorched scallop, ramp-goat's milk butter emulsion; Sauvignon Blanc 'Moarfeitl: Neumeister, Styria/Austria 2007); Halibut (poached halibut, braised daikon, baby radish and turnips; Sesame Court Bouillon, Traminer, Domaine Andre Tissot, Arbois, Jura 2006); Codfish (sauteed codfish, stuffed sweet peppers, octopus sauce and basquaise emulsion; Pinot Noir, By Farr, Geelong/Australia 2005); Surf and Turf (escolar and seared kobe beef, sea bean salad and eggplant fries, with Mr. Kaufman's pesto and anchovy sauce; Chateau Haut-Bages A verous, Pauillac Bordeaux 2001); "La Faisselle" (artisan fromage blanc -- produced exclusively for Le Bernardin by the Vermont Butter and Cheese Company -- with toasted almonds and honey; Tokaji, Late Harvest, Oremus, Hungary 2005); Chocolate-Chicory (chocolate cremeux, pain de genes, orange "meringue," chicory ice cream; Museum Muscat Reserve NV. Yalumba. Rutheralen/Australia). Chef's Tasting Menu (per table only, $135 per person / with wine pairing, $220 per person): Kampachi (kampachi tartare, marinated Japanese cucumber, aged citrus vinegar; Assyrtiko, Thalassitis, Gaia Estate, Santorini, Greece 2008); Octopus (charred octopus, fermented black bean-white peach sauce vierge, ink-miso vinaigrette, purple basil; Riesling, "Urziger Wurzgarten", JJ Christoffel Erben, Mosel, Germany 2007); Snapper (bread-crusted red snapper, zucchini-mint and coriander compote in a rich citrus broth; Chateau Carbonnieux, Pessac Leognan Bordeaux 2006); Black Bass (crispy black bass, braised celery and parsnip custard, Iberico ham-green peppercorn sauce; Rioja, Reserve 'Vina Ardanza' La Rioja Alta, Spain 2000); Escolar (white tuna poached in extra virgin olive oil, sea beans and potato crisps, light red wine bearnaise; Malbec - Mendel - Mendoza/Argentina 2007); "La Faisselle" (artisan fromage blanc -- produced exclusively for Le Bernardin by the Vermont Butter and Cheese Company -- with a coulis of local strawberries; Torrontez Sparkling-Deseado Familia Schroeder, Patagonia Argentina); Hazelnut (hazelnut gianduja parfait, caramelized banana, brown butter ice cream; Muskat Ottonel, Trockenbeerenauslese No. 5, Alois Kracher, Neusiedlersee/ Austria 2004).